Stem turns are a halfway point between snowplough turns and parallel turns. In Stem turns the skis are parallel as we come across the slope, but the snowplough is still used as we turn through the fall line. With the snowplough you may well find that as you go across a slope the uphill ski can feel very awkward, as it is almost sideways to the direction you are traveling in. This is because the snowplough position is good for controlling speed as we point down the slope, but as we come sideways the uphill ski actually works against what we are trying to do. When we go across a slope, the position with the most control is to have the skis parallel, as then both skis are sideways to the slope, both giving us control and also not working against each other. So with stem turns we maximize our control through all phases of a turn by coming across the slope with the skis parallel, and keep control of our speed as we pass through the fall line, by using the snowplough. This means we always have control over our speed, and as long as the stem turn is used well it can get you down relatively steep slopes with absolutely no problems. As we have our skis parallel while we are going across the slope now, it is important to explain the correct traversing position for this, and why this is the position. The reasoning behind this is also covered in more detail in the stance section. As shown in the diagram below, when we travel across a slope, there will be a downhill ski and an uphill ski. Your weight should be mostly on the downhill ski, as explained in lateral weight distribution, with the skis hip width apart. As we are sideways to the slope it means that the downhill ski must be below the uphill ski. However in ski boots you can only move your ankles a very small amount, which means in order to make the uphill ski higher than the downhill ski, the uphill knee needs to be brought forwards. As the uphill knee is brought forward so is the uphill ski, leaving the uphill ski slightly in front of the downhill ski. The position for the body that allows the most movement and flexibility with the feet in this position, as well as comfort, is to have the shoulders parallel with the position of the feet. This makes the whole body face slightly down the slope and not in the direction of the skis, which also gives you a better view of where you are going. You should also be leaning slightly forward to put your weight in the middle of the ski (longitudinal weight distribution), and to the downhill side (lateral weight distribution), which is what puts the weight on the downhill ski. Obviously the steeper the slope is, the higher the uphill ski will be, and therefore the further in front the uphill ski will be, making the body point even more into the fall line. Lastly, as we ski across the slope we don't dig the edges into the slope too much, so that the skis slide slightly sideways as we are coming across, which also helps us lose any extra speed we might have. We initiate and perform the stem turn in mostly the same way as with a snowplough turn, with the only real difference being that we have to initiate the snowplough as we turn down the slope, and take the snowplough away as we turn back across the slope. However because we start and finish a turn with the skis parallel, the edges on the skis that push into the snow need to be changed. In the snowplough turn the inside edges are always pushing into the snow and they do not change, but in a stem turn we start with a parallel traverse and end with a parallel traverse in the other direction. When you traverse across a slope to the left with your skis parallel, the left edges on both of the skis push into the snow, but when you traverse to the right the right edges on both of the skis push into the snow. Therefore at some point during a turn each ski has to change the edge that is pushing into the snow. How we change the edges is another reason that the stem turn is the natural progression from the snowplough turn, and it is to do with the snowplough position that we use in the middle. As we change the skis from parallel to a snowplough shape, only the ski that will be on the outside of a turn changes the edge that is pushing into the snow, and as we bring the skis parallel again towards the end of a turn, only the inside ski changes its edge. This means that the skis change their edges at different times, and there is always at least one ski pushing its edge into the snow, acting as a brake and helping you keep control and your balance. 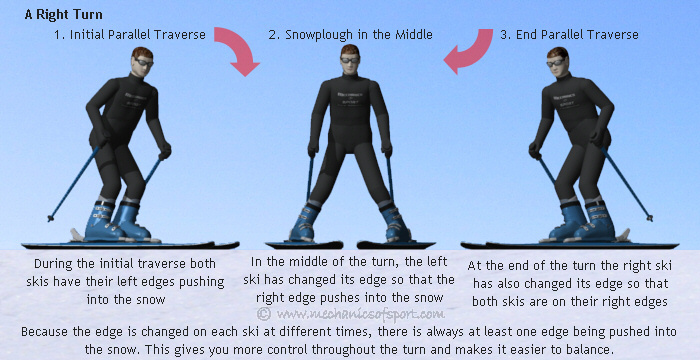 In the parallel turn which is the next step in turning, the skis stay parallel throughout a turn, and both edges have to change at the same time. This means for a short period of time both skis float on their bases, without the edges pushing into the snow, and during this time neither of the skis give you much control, or brake, creating a faster acceleration in the middle of a turn with less balance. 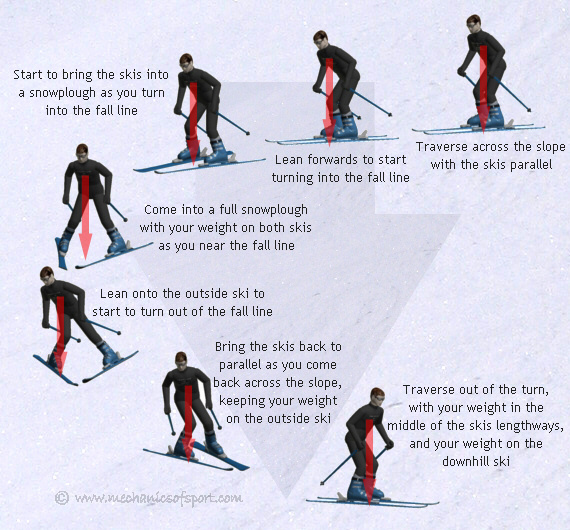 Below is an explanation of how to do a stem turn, assuming we are starting by going across the slope from left to right with our skis parallel, and our body in the position described above. As we are going across the piste, the first thing we need to do is initiate the turn. To do this we bring our weight evenly onto both skis, and lean forwards to get the front of the skis to start falling down the slope, making sure the edges of the skis are not digging into the snow too much so that the skis can slide and turn. As the skis start to turn down the slope we bring our skis into the snowplough position, so that we have a full snowplough by the time we are nearing the fall line. We then bring our weight back to the middle of the skis lengthways (longitudinally), and lean to the right putting our weight on the right ski. The right ski then falls down the slope first making us turn left, and bringing us back across the slope in the other direction. As you turn back across the slope start bringing the skis back to parallel, so that they are together by the time you are coming back across at the angle you want to be, keeping your weight in the middle of the skis lengthways and over the right ski (downhill ski). Then continue across the slope and repeat the process but the other way round the next time you want to turn. The diagram below shows the major steps in the stem turn. 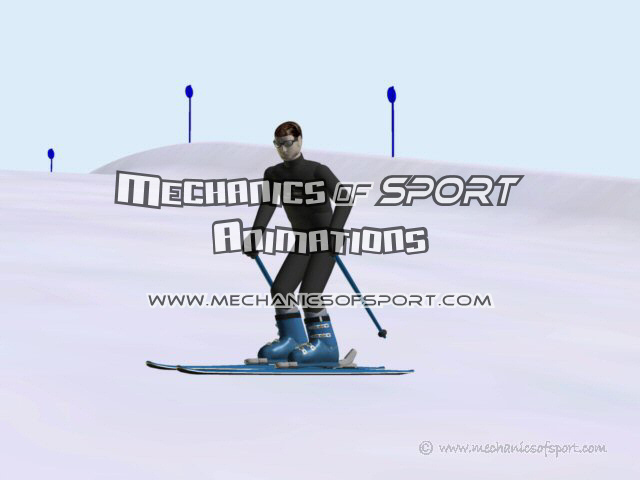 The animations below shows the 3D skier doing a stem turn in each direction on a piste in the virtual ski area. If you make stem turns when going a bit faster, you can put your weight onto the new outside ski earlier. This is because you already have enough speed to get a reaction from the ski, instead of having to rely solely on gravity at the start of the turn. Leaning back - It is important to make sure you keep your weight in the middle of the ski or the front of the ski will rise up and you will lose all control that part of the ski provided (longitudinal weight distribution). Swinging the body - To make a stem turn you only need to move you weight between the skis. 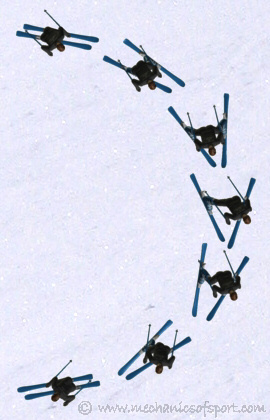 Many people swing their body to try and make the turn quicker, but although this can turn the skis, it is not needed and leaves the body out of position which creates other problems. If you want to turn more quickly you just need to lean over the outside ski more. Giving up to early - When you move you weight across to one ski, you will not change direction instantly, you need to have enough patience to keep your weight there until you start to turn. Not bringing the skis to parallel properly as you go across the slope - Many people have too much weight on the uphill ski as they come out of the turn, and struggle to bring the skis parallel. 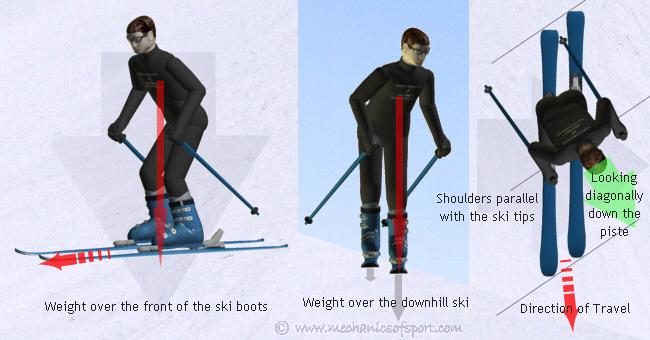 As long as your weight is on the downhill ski, the uphill ski should be easy to move into the parallel position. Practise at first on a slope that is not too steep, and take your time through the turns. Stem turns will enable you to go faster and down steeper pistes than snowplough turns, but you need to get used to the extra speed first or you can start rushing the turns and lose the correct technique. Taking ski lessons will introduce you to skiing exercises based on how people learn to ski in real life, so that you learn to stem turn with the correct technique. On to the Sideways Sliding section.